With summer vacations winding down and the world getting back to the business of school and work, it is the perfect time to read Redeeming Administration: 12 Spiritual Habits for Catholic Leaders (Ave Maria Press, 2013). 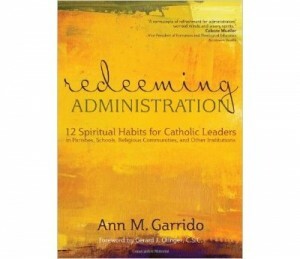 Author Ann Garrido serves as a program director at the Aquinas Institute of Theology in St. Lewis. Having been in an administrative role for many years, she brings a unique and much-needed perspective to the topic of Catholic leadership. At first glance, it would seem that this book would have a very limited audience, but that is not the case. Even those of us whose administrative domain consists of only one’s family can gain much from reading these pages. In addition to improving our own outlook and spiritual lives, we can also gain a greater appreciation for and understanding of those who work in administrative capacities. As Garrido readily admits, “administrative tasks are often considered odious” and for those not in administration, those in that role are often viewed with suspicion. It’s tough to be the ones who have to make the hard, sometimes unpopular, decisions! Garrido has provided one habit for each month for administrators to focus on. These include: breadth of vision, generativity, trust, agape, integrity, humility, courage, reflection, humor, forgiveness, embrace death, hope, and a bonus topic of learning to make peace with time. For each of these chapters, she also provides a holy administrator as an example of this habit in practice. Saints such as Angela Merici, Gregory the Great, Martha, Ambrose, Thomas More, and Rose Philippine Duchesne are featured. It was also wonderful to learn about the lives of some lesser-known saints such as Bruno, Joseph Mukasa Balikuddembe, and Mary MacKillop. Each of these holy role models has something to teach us about leadership and spirituality. Each chapter also includes questions for reflection and prayer. Garrido says that being an administrator is a job full of interruptions and that she needed to find meaning in her work or she needed to quit. This book developed from her reflections. The word administer actually comes from Latin and means “to minister”, so Redeeming Administration: 12 Spiritual Habits for Catholic Leaders is for anyone who leads as a means of serving others. Pick up a copy for your favorite bishop, pastor, and principal, and while you are at it, you might want to pick up a copy for yourself. There is much wisdom and practical advice within its pages.